Within the world of sports betting there exists bookmakers where you bet against the house and betting exchanges where you bet against other people. The latter can be compared to a regular stock exchange, the main difference being that the traders buy and sell bets on the outcome of events such as a football game rather than stocks. What makes the sports market interesting from a trading perspective is that it is more inefficient than the financial markets, which in turn creates arbitrage opportunities. At the free site oddsportal.com, one can compare the odds of a game provided by different bookmakers and betting exchanges, which enables you to see the inefficiencies that exist within the sports market with your own eyes. 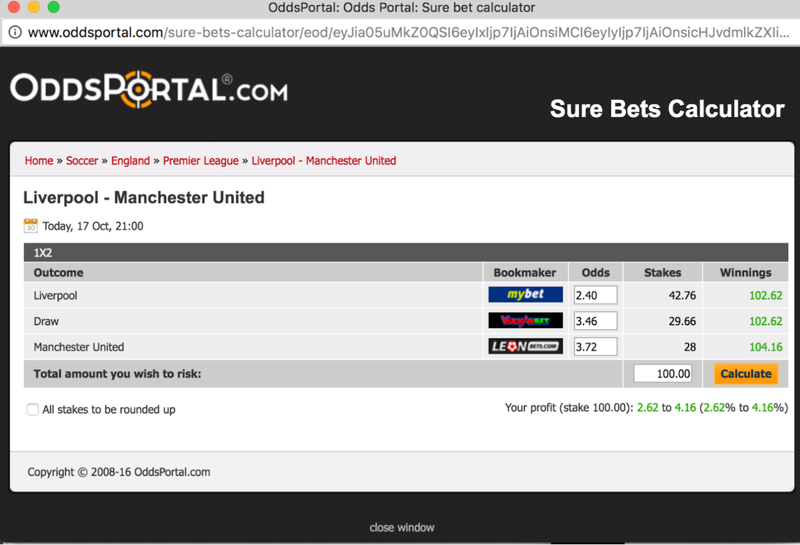 I’ve included a screenshot of the odds from different bookmakers on the Liverpool — Manchester United game that was played on 17.10.2016. The odds of a game’s outcome reflect what the bookmaker believes to be the probability of that outcome. The probability of an outcome equals the inverse of the odds, in addition one has to adjust for the bookmaker’s payout rate, which is the amount of money that they pay back to their customers. For instance Mybet has a 90% payout rate, which means that they take a 10% cut of the money that is placed on this game. Next let’s compare the odds provided by two different bookies. If the odds deviate too much from the rest of the market, bookmakers are able to void bets placed on that game. Imagine the following scenario: you are following the recommendation in the screenshot above, by placing money on a home win at Mybet, a draw at Vulkan bet, but when you are trying to place a money on an away win at Leonbet, you are limited to place a maximum of $1. You are now unable to complete the surebet, which results in a huge negative expected value on the bet. Now whether you are investing in stocks or sports the most important principle is to avoid loosing money, because if you loose 50% of your capital ($10 000 → $5000), you will need to increase it by 100%, just to return to the starting point ($5000 → $10 000). Because of the disadvantages with arbitrage trades (surebets) listed above, a better strategy is to place a high volume of +EV trades. 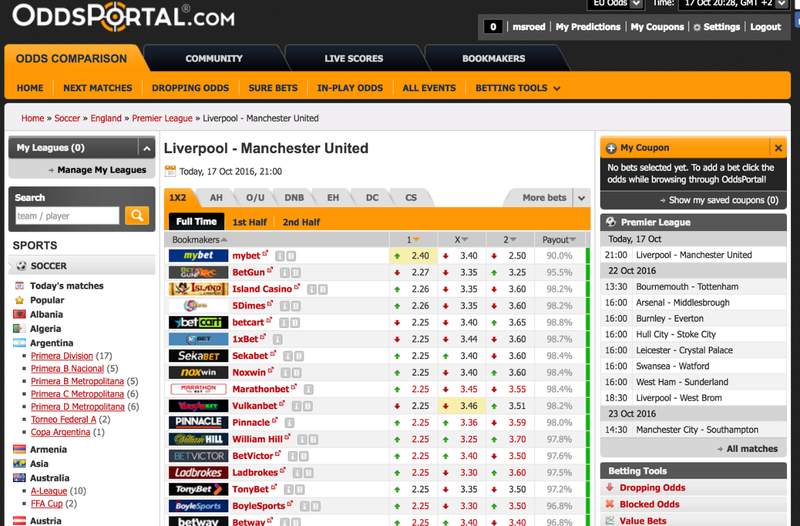 An example of a value trade would be to place money on a home win to Liverpool, which has a +6.06% EV. Over a large sample size placing +EV trades should be a profitable strategy in theory. This is based on the assumption that Pinnacle odds accurately reflect the true probability of a game’s outcome, which will be discussed next. HOW EFFICIENT IS THE SPORTS MARKET? HOW DO BOOKMAKERS DECIDE ON THEIR ODDS? Typically an odds line will be placed by a bookmaker after they have performed a statistical analysis, which takes all the information they have available into consideration, for instance the team’s lineup, injuries and historical performance. Once the initial odds line has been set it will be adjusted based on market movements, meaning how much money is put on the different outcomes. The efficient market hypothesis used in financial markets states that it is impossible to beat the market, because the existing asset prices always incorporate and reflect all relevant information. So if an asset is underpriced in the stock market, it will lead to investors buying the stock until it returns to its intrinsic value or in other words a fair price. The same applies to the sports market, if a bookmaker underpriced the odds of a particular outcome, let’s say a home win to Liverpool, then smart sports traders will put money on this outcome until it is priced at a fair value. So for instance if someone places a $1 million on Liverpool to win, the odds will shift. If another person believes that the odds are now mispriced and that there is value on the other side, they might place $1 million on Manchester United to win and the odds will shift again and thus eliminating the inefficiency. The more money that is put on the outcome of a game, the more likely it is that the all of the inefficiencies have been eliminated. Thus the odds at the time the match kicks off will reflect all of the information that is in the market. This odds at the kick-off time is referred to as the closing odds. ARE BOOKMAKERS ABLE TO ACCURATELY PREDICT THE OUTCOME OF A GAME? Now which bookmakers are the best at accurately predicting the outcome of a game? First, let’s define the bookmakers and exchanges into two main categories: 1) soft bookmakers, who have a low payout rate (>= 90%) and low limits on how much money can be placed on games. 2) Sharp bookmakers, who have a high payout rate (<97%) and high limits on games. What typically happens at the soft bookmakers is that they limit winning players in order to protect their profit margins. The sharp bookmakers however, choose the opposite strategy, they want to have smart bettors at their site because it makes their odds more accurate. The sharp bookmakers have much higher limits on the amount of money that can be placed on a game. This basically allows them to have more information incorporated into their odds, which makes the bookmaker able to more accurately predict the real world outcome of the game. Through looking at the correlation between the expected probability of a game’s outcome and the actual outcome it is possible to determine how accurate a bookmakers’ odds are. From a sample size of 397,935 football games offered by Pinnacle Sports, a sharp bookmaker, there existed a high correlation (r-squared = 0.997) between the closing lines and the observed probabilities. In other words, Pinnacle’s odds accurately predicted the real world outcome 99.7% of the time. Meaning that that their odds are very efficient. In their business models, bookmakers make a tradeoff between their margin and the total turnover of bets that are placed through their service. Because Pinnacle is so confident in their odds being correct it enables their business model to rely on a high volume of money being placed on their games and them to have a low margin, 2 % and a 98% payout rate to their customers. The majority of the soft bookmakers are European, while the sharp bookmakers operate in the Asian market. Because of the higher amount of money that is placed on games in the Asian market, it has higher liquidity. This attracts professional sports traders with large bankrolls, which increases the level of competition. The consequence being an efficient market because smart sports traders exploit any inefficiencies that occur. Now it is easier to finds arbitrage opportunities in the European market, however, the limits on how much money you can place on the game effectively puts a cap on potential earnings. Because the Asian market is more efficient, the best sports traders are only able to beat the market with a couple of +EV%. They counter-balance the lower edge by placing a high volume of trades at high sums. Because the soft bookmakers limit winning players, sports traders will eventually have to move into the Asian market. A rational investor will attempt to maximize returns while minimizing risks. This implies that they will invest in the markets or financial instruments where the potential return / risk ratio is the highest. Investors in financial markets can broadly be divided into two categories: Long-term oriented investors who rely on fundamental analysis and short-term oriented investors who follow a trend or technical analysis. The former are often referred to as value investors, which means that they try to identify assets that are underpriced by the market. They also require the asset to be significantly underpriced, which provides a margin of safety, before they purchase a given asset. What I view as the main disadvantage for the value investors is that, because they are oriented towards the long-term, which can be anytime between 3–10+ years, it means that they will tie up their capital in investments for a long time before potentially reaching a positive return on investment. In the meantime, you do not know whether your hypothesis that the asset is underpriced holds true. For example, if your bankroll consists of $10 000 and you place sports trades with an average of + 3% EV per trade. +EV being the trades where you get a higher odds than the closing lines of the sharpest bookmakers. Now let’s assume that you place your trades with a flat structure* of $100 per bet and that over the weekend you place 100 bets. Then your expected profit would be: 100 (trades) x $100 * 1,03 (EV) — $10 000 = $300. Now obviously, whether you endure winning or losing streaks will have an impact on your actual profits . If we assume that there is no variance in the 100 trades we placed or in other words that we are neither lucky nor unlucky, our actual profits would be equal to our expected profits of $300. In reality, the variance will only even out if you are able to place a high amount of +EV trades. *Your bet sizing is an important topic when trading in the sports market. You can read more about bet sizing on the following link and also run a simulation of how different input variables affect your potential profits.